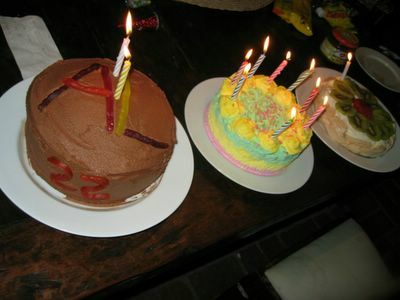 Sarah Cooks: Happy Birthday Allstar! Hello! 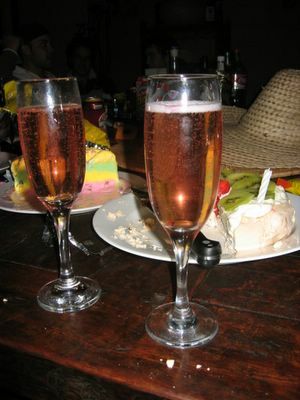 I’ve just come back from 2 fabulous nights at my friend Alistair’s holiday house with some friends to celebrate his 22nd birthday. You may remember Alistair (aka Allstar) from such birthdays as his 21st! (Last year). Last year I think 15 people went up, but this year there were over 20 (!!!). I had to bake up a storm! 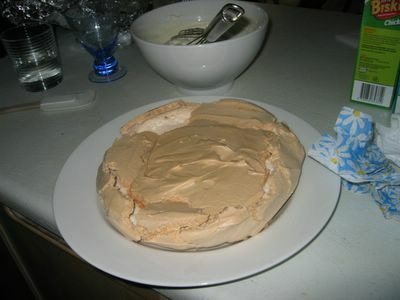 I baked everything a couple of days before we went up to the holiday house, and iced and assembled the pav and chocolate cake up at the house. 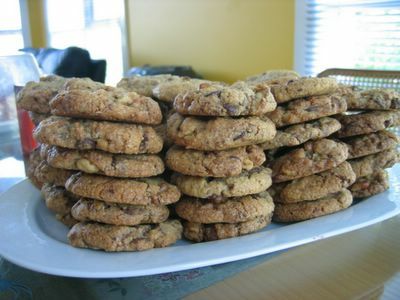 The recipe for The Rock's favourite chocolate chip cookies are basically the same as that Neiman-Marcus cookie recipe that got spread around the internet in the 90's. (I made those back in high school a few times - delicious!) The dough has butter, brown and white sugar, eggs, flour, chocolate chips, grated chocolate and walnuts. 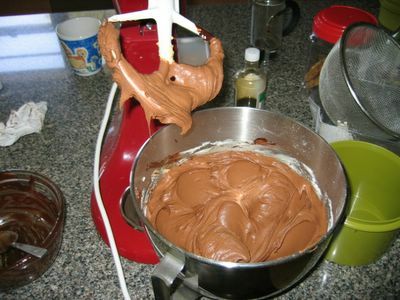 It makes a very, very stiff dough - you will need biceps like The Rock himself to stir it up. Then you roll the dough into balls and bake for 10 minutes. The recipe says it will make 4-5 dozen cookies, but I got about 6 dozen. My balls must be smaller than The Rock's. Hmmm. I saved a few for my family, and packed the rest in a tupperware container for transport. 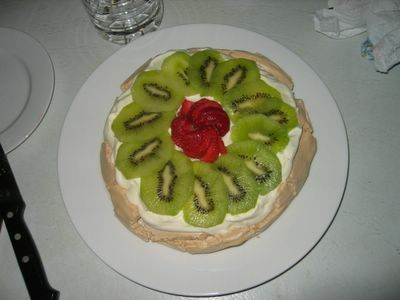 Now, the pavlova. A pav is a pav is a pav. 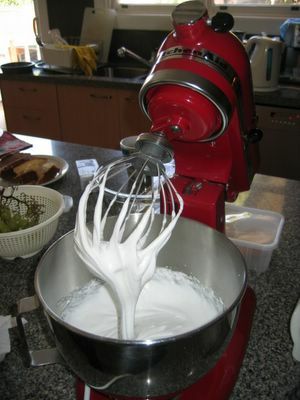 But check out how awesome the meringue looks in the Kitchen Aid! There is some serious power underneath the slick red exterior. Once it was cooked, I put it in a tin for transportation purposes. 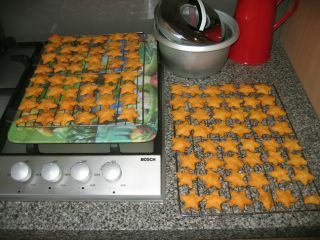 I made these cheese stars last year for Al's birthday. They went down really well, but after that, I forgot about them completely and haven't made them since. This was until Al called me a week or so before this year's trip, specifically requesting that I make them again. 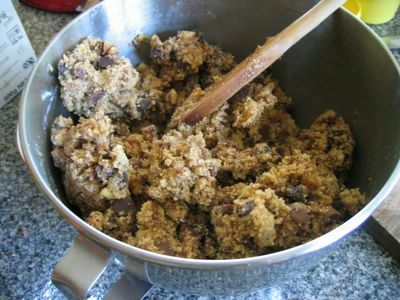 Knowing how much he liked them, I made a quadruple batch, which resulted in 197 stars. These stars are super-easy - just mix red cheddah cheese, self-raising flour, cayenne, butter and cayenne in a food processor, roll out, cut into stars, and bake. Ta-dah! 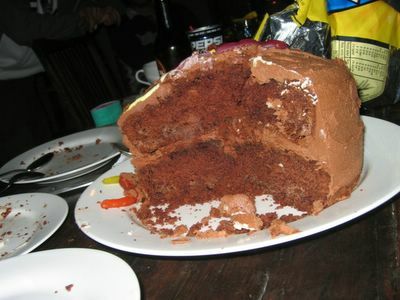 The chocolate fudge cake needs no explanation. It's brilliant! I've made it probably a dozen times by now, and my friends know it as the "Sarah makes the best chocolate cake in the whole world" cake (they came up with that name, not me!) 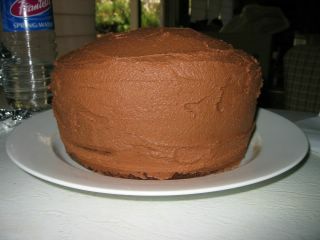 Thank-you to Nigella for the recipe! I baked the cake, (2 layers) adding some chocolate chips because there was an open packet in the kitchen leftover from the cookies, and I was seriously in danger of inhaling them all. Once the cakes were baked and cooled down, I wrapped them in foil, ready to be transported and subsequently iced. And here's the icing. I put it in a tupperware container for transportation. 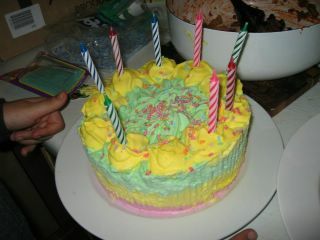 Check out that icing! I see that my KitchenAid really got a workout with all this baking. The night I arrived, I plonked the cookies and the stars on the table, and they were pretty much gone by the next morning. Success! 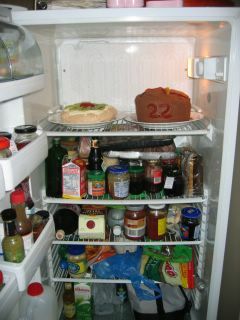 Later that day, my friend Symone and I iced the, and put it in the fridge to set. 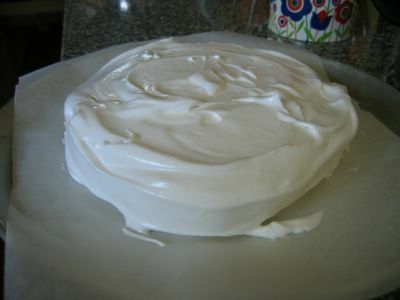 I was afraid that the icing would have gone solid and all lumpy, but remained smooth and spreadable. Cake from above - We decorated it with some snake lollies. Al's brother Nick also brought up a Freddo Frog ice-cream cake, which has lots of little chocolate freddo frogs inside. Yum! Mmm... so much sugar! So much fat! So good! It all looks wonderful! Fab work, sweetie. Al must be very grateful to call you a friend, hehe. 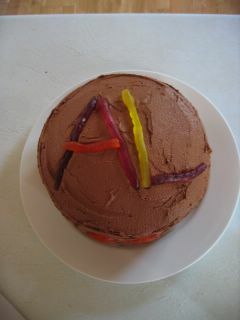 Happy Bday, Alistair!! Completely impressive, Sarah!! Holy hell -- 197 of those cheese stars!?!?! You did a beautiful job -- everything looks amazing. Must have been a blast.